As I write, The Reverend Canon Sandra McCann, M.D. and Dr. Martin McCann are winging their way home to Columbus, Georgia after 13 years in Dodoma, Tanzania and Maseno, Kenya. They are retiring from their service as missionaries and are ready to begin their 3rd life! There were many farewell parties for them as they prepared to leave their home at Msalato Theological College. Sandy wrote to us of the most poignant farewell dinner given by her house girl of 9 years, Pendo. This is her description. “We entered her little living area and there were about 10 little boys and girls from several months old to about 10 years old sitting on the floor on their best behavior. Seche and Moti (Pendo’s sisters) were there along with Musa, Pendo’s husband, and Given, her second oldest son (around 14) who rode with Martin every day to school in town. She served beans and rice. For Martin and me she had bought small bottles of safe water. It was so precious to be with them. They had some sort of a small light that was either a flashlight or a solar thing that gave off enough light for us to eat by. I noticed that as some finished they went through a curtain and came back with their plates washed for the next person. Also, the little girl of Moti’s, maybe close to a year (just walking) was fed by all the children. She would walk from child to child and they would take some of their rice and put it in her mouth ~ fingers of course. All three sisters have worked for me off and on with Pendo being with me since our very first day.” The simplicity and the love that Sandy described touched the depths of my heart and soul. 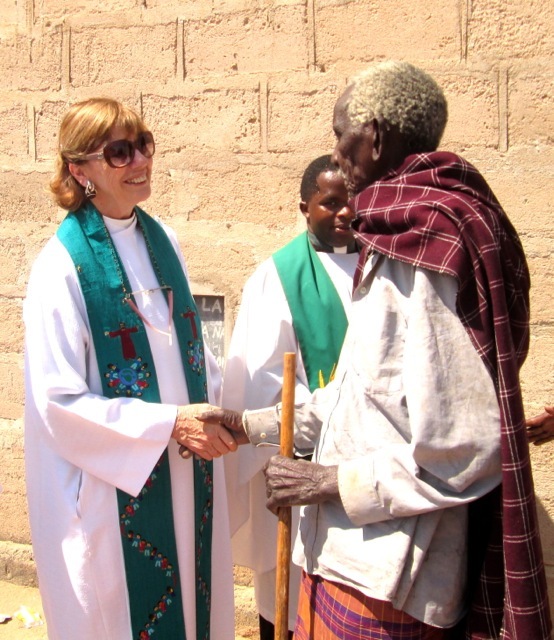 She later wrote that the bishop of Central Tanganyika came early Friday morning to pray with them before they left. Pendo stood in the background crying. It made me cry too. Jessie and I had to postpone our scheduled return to Dodoma this past September because of our surgeries, HOWEVER, we already have our airline tickets for March 1, 2016 so we shall return to check on projects and to begin new ones. It won’t be the same without Sandy and Martin, but we will carry on. Sandy said how serving God beyond the geographic boundaries of her own country has shaped her ministry. She and Martin in turn have shaped our ministries. Thank God for Sandy and Martin ~ well done good and faithful servants. Look for more post from us as we come back to life!